The first time I saw Ferron onstage at the Princess Cinema in April 2009, I could understand why this Vancouver-born singer songwriter and poet is known as a cultural hero, a folk legend and a women’s music pioneer. Among other things her poetic lyrics and soft spoken vocals speak of wisdom, hope, strength, passage of time and memories. The audience is transported into her songs and can’t help but relate to her words or be inspired or moved by them. The experience brings the audience to a place of intimacy, vulnerability and connection. Ferron hit the road in 1967 at age 15 with only a shopping bag, a toothbrush, a waitress uniform and her Leonard Cohen album. 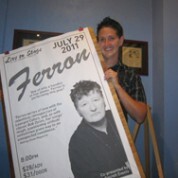 Now with 14 album releases over the last 30 years, Ferron has become one of Canada’s most well-known folk singers. 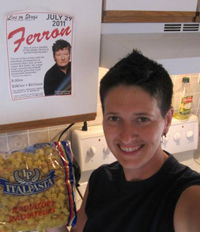 With my eager encouragement, Ferron received an invitation by John Tutt to come back to the Princess Cinema stage and she graciously accepted even though at this point in her life she is now limiting her shows and tours. This may be our last chance to see Ferron on stage in Waterloo and I urge you to not let this extraordinary opportunity pass you by. Treat yourself to this magical, memorable evening and let Ferron’s lyrics travel with you in your lives.